Did you know that every year 7,000 bikes go to landfill in East Lancashire? Many simply need a little renovation, refurbishment and tender loving care to revive them to their former glory; and this is the aim of the ‘Bike Revival’ scheme funded by Connecting East Lancashire. The scheme, which sees landfill bikes recovered, refitted and redistributed to areas within East Lancashire, aims to help reduce vehicles on the roads, help the environment and get people fitter and healthier. As an active member of the scheme, NLTG are supporting their learners to develop bike rebuilding skills through a specialist training course funded by Connecting East Lancashire. 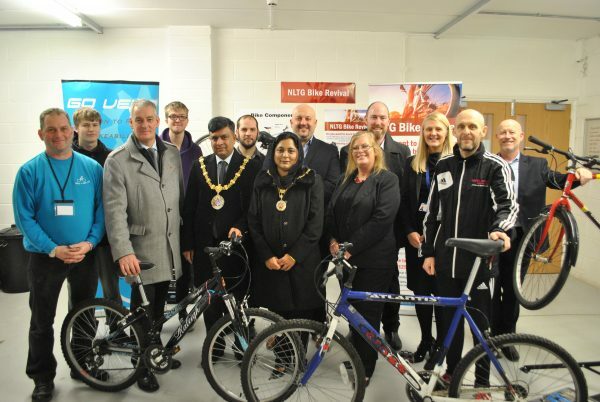 At NLTG’s ‘Bike Revival’ launch event held on 25th January, MP Graham Jones, the Mayor and Mayoress of Hyndburn, Lancashire County Council’s Chris Hadfield and Amanda Jenkinson, were able to see first-hand learners putting their new-found skills into practice and talk about the scheme. As part of the Bike Revival scheme, some of the bikes renovated by NLTG will be donated to young people to enable them to travel to work, while others will be available for sale to the community at a competitive price.